the time and click hereto vote on MY 10 Ebay Reviews and Buying Guides. Open each one and at the bottom of each one is a voting tab. 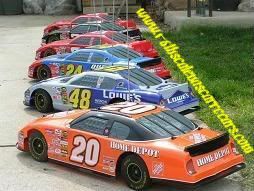 These 1-6th scale Nascar Rc cars are NO LONGER in production, get your spare parts NOW. Once these are gone they are gone forever. If you are looking for batteries and or battery chargers and do not see them on my ebay link, I might have some spares standing by. 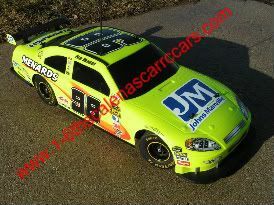 Want to sell a used 1-6th scale Nascar Rc cars ? 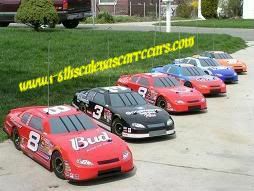 Want to buy an Used 1-6th scale Nascar Rc cars ? 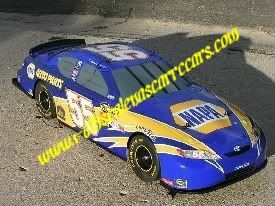 The LAST 1-6th scale Nascar Rc car ever produced ! ! ! 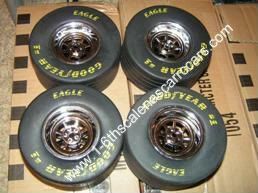 There is also available for the Boyd Coddington Rc Hotrods. Display Your Autographed Boydster II ! New Nascar Rc car and Boydster Rc Hotrod shelves !!! 1-6th scale Nascar Rc car. other series of drivers cars too! 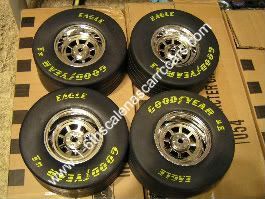 Pictures of all of the 1-6th scale Cars WITH the Chromed Wheels. They are made "to order"
There are 13 total Hobby Grade cars produced. Dale Earnhardt Jr. # 88 AMP/Energy Drink C.O.T. Tony Stewart # 20 "Home Depot"
Jimmie Johnson # 48 "Lowes Home Improvement"
Jeff Gordon # 24 "Dupont"
"American Hot Rod" for the interview, shop tour, autographs on my Boydster II and the great time I had at your shop. I have updated the Boyd Coddington Rc Hotrod page with pictures. I have NO Boydsters left for sale !!! People at the Grand National Roadster Show were great!! These Boydsters were flying out the door! I was able to get new autographs on the "Tribute Boydster rc car"
NONE left of the LAST OF THE BOYDSTERS! Now, each one will be graded from "opener-user" to "Collector Grade"
These 1-8th scale Boydsters are NO LONGER in production, NO spare parts ANYWHERE. Want to sell a used Boydster II? Want to buy an Used Boydster II? Own a Boydster II R/C car? please contact me. I need photos of the boxes and photos of the cars themselves. I also will consider buying them if they are New and unused or SLIGHTLY used and the body shells are unbroken. Photos From the 2012 Grand National Roadster Show in Pomona, Ca. More Autographs on my 1-8th scale Boydster II R car!!!! 1-8th scale Rc "American Hot Rods"
videos of this really cool Hot Rod!!! I am looking to find 2 cars! (these are rare) I am looking for the Tony Stewart #20 Home Depot Foam Padded Version and a Jimmie Johnson #48 Lowes Foam Padded Version for purchase. I am on Yahoo and MSN instant messengers also !!! 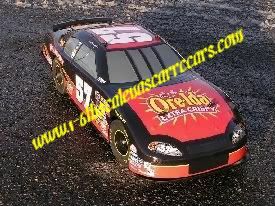 Copyright 2007 - 2013. www.1-6thscalenascarrccars.com - www.boydcoddingtonrccars.com. All rights reserved.